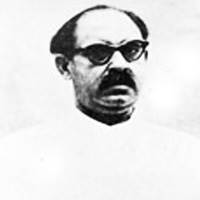 Chiragh Hasan Hasrat belongs to the category of those writers, poets, and journalists who made a lasting impact on the literary and intellectual scenario of Urdu. He was born in 1904 at Pooncch in Kashmir. He acquired his proficiency in Arabic, Persian, and Urdu at home before passing his matriculation examination from Poonch and B. A. from Lahore. Subsequently, he got associated as a journalist with three important newspapers like Zameendar, Insaaf, and Ehsaan. During the Second World War, he also edited Fauji Akhbaar. He also wrote a humorous column under the pen name of Sindbad Jahazi for the daily Imroz which were very well received by his readers. With all his engagements as a journalist, Hasrat got little time for writing his poetry. In spite of this, he wrote a long poetical narrative about the rise and fall of Muslims in several volumes called Saguzasht-e-Islam. Equally important are his works on Mohammad Ali Jinnah and Mohammad Iqbal which evoked healthy intellectual response and came to be established as rationalistic studies of the two seminal figures of contemporary history of the subcontinent. Hasrat passed away on 26 June, 1955 at Lahore.